Looking to buy an Argocat ? 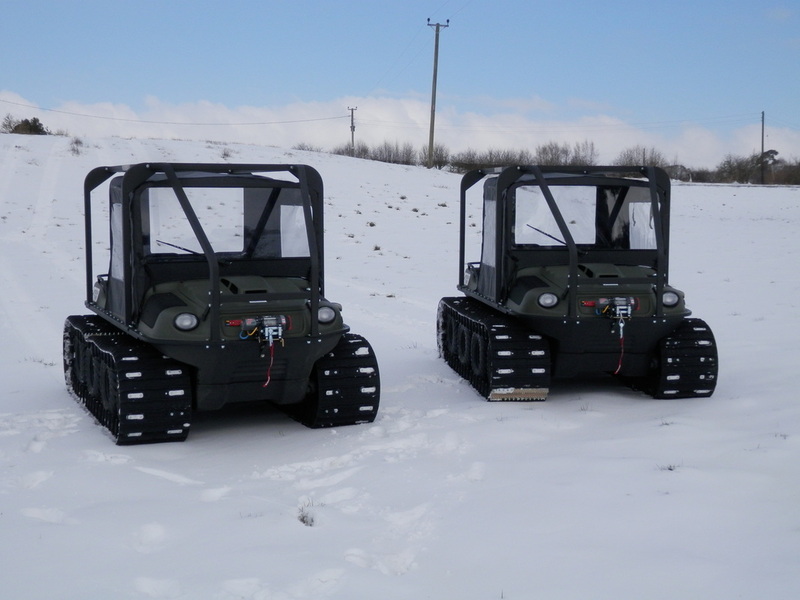 ​There are many models of 6x6 and 8x8 Argocat which have been sold in the UK since 1970. Many of these vehicles are still giving good service if they have been regularly maintained. We sell Argocats of all ages, and we supply a full range of PARTS for ARGOCATS of every age. 1962 - Ontario Drive and Gear (ODG) was founded in Canada, as a subsidiary of a German company its objective was to design and manufacture power transmissions and gears for the North American market. ODG developed and produced a special transmission for a 6-wheel drive, skid steer ATV -- the Amphicat. 1971 - ODG introduces a stretched version of the Argo - an 8 wheeler. ODG now offered the largest capacity ATV on the market and it was powered by the 440cc Kohler 2-cycle engine. Also in 1971 a state-of-the-art vacuum forming machine was installed, allowing production of large quantities of vehicle bodies from coloured ABS sheet material. 1975 - ODG switches to the very durable, high density polyethylene as the body material for ARGO and introduces the 4-cyle ARGO. Using a Tecumseh four stroke engine ODG's market sector shifted from the recreational sector to the utility and industrial/commercial sector. 1985 - Briggs and Stratton 656cc twin cylinder I/C engine introduced into the 6 Twin which replaced the Argo 6 Heavy Duty. As a result of this model's success ODG introduced the Argo 8 Twin as a smooth running successor to the Argo 8 Heavy Duty. 1987 - Argo 8 I/C redesign made this the most popular model in the Argo line-up. 1989 - Argo 8x8 Magnum and Argo 6x6 Magnum introduced, this was the top of the range model that featured new clutch components and a transmission ratio which responded to customer requests for higher land speed. Ending a fifteen year run the last single cylinder 16hp Tecumseh powered vehicles come off the assembly line. 1992 - ODG marks 25 years with Argo by producing 25 silver bodied Vanguards. 1993 - ODG introduces the first liquid cooled engine in the new ARGO CONQUEST. Long lead times developed as demand far exceeded production rates. 1995 - Argo 8x8 RESPONSE introduced the answer for the individual who needs eight wheel capacity at an attractive price. 1997 - 6x6 BIGFOOT invades the market, with its extended wheelbase and 25" tyres this model has increased stability and ride comfort over rough terrain. ​2000 - CENTAUR 8x8 Diesel launched, a new concept from ODG, mid mounted, diesel engine, unique chassis design and steering wheel control. 2004 - ARGO 8x8 AVENGER launched. 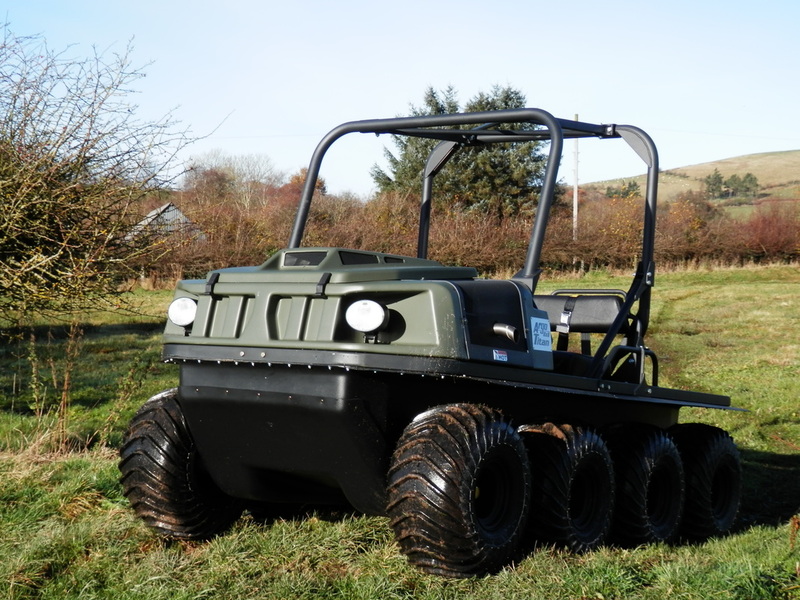 The most powerful ARGO yet, 26hp Kohler liquid cooled petrol engine, 25" wheels and tyres with increased ground clearance, new chassis and body design, "T" bar steering, full instrumentation. Leading the way in the 21st Century ! This is the ULTIMATE off-road and leisure all terrain vehicle. ​2006 - ARGO 6x6 FRONTIER launched. The most powerful 6x6 ARGO yet, 23hp Briggs and Stratton air cooled petrol engine, 24" wheels and tyres with increased ground clearance, new chassis and body design, "T" bar steering, full instrumentation. Longer wheel base, wider track Frontier 6x6 offers ultimate 6x6 stability and performance. 2006 - September - ARGO launch the 31HP EFI AVENGER 8x8, the most powerful ARGO ever ! Kohler fuel injection system boosts output an torque from this class leading fuel efficient power plant. 2007 - ARGO 8x8 FRONTIER launched. A direct replacement for the Response 8x8, the new FRONTIER 8x8 has the 23hp Briggs and Stratton air cooled petrol engine, 24" wheels and tyres with increased ground clearance, new chassis and body design, "T" bar steering, full instrumentation. Longer wheel base, wider track Frontier 8x8 offers great load carrying capacity at an affordable price. Standard features include 24" tyres, full length skid plate and front and rear axle extensions. 2008 - AVENGER 700 and 750 models - ARGO launch AVENGER 700 (26hp) and AVENGER 750 EFI (31hp) Avenger models, with new digital dashboard display. 2009 NEW ARGO ribbed/runamuk tyres for the 25" AVENGER 700 and 750 vehicles, with redesigned triple seal axle bearings. 2010 - AVENGER 750HDI - new ADMIRAL triple differential steering transmission and fully hydraulic braking system coupled with the proven 31HP Kohler EFI makes this the most versatile ARGO ever. 2012 - ARGOCAT TITAN XTI - 31hp fuel injection engine, the new ADMIRAL triple differential steering transmission and fully hydraulic braking system from the HDI , heavy duty chassis and axles from the industry proven CENTAUR. The TITAN is a fully amphibious robust workhorse. Call us for full specification and pricing 01686 413151. ​24 HP Lombardini diesel added to the TITAN range. 2014 - ARGOCAT Frontier and Avenger 8x8 models now with reinforced upper body support in the load area. 2015 - ARGOCAT 8x8 FRONTIER 750 EFI - 23HP Kohler Command Pro V Twin fuel injected engine. Powerful, smooth, economical and at a competitive price. All the features of the Avenger chassis and driveline, full length skid plate and front and rear axle extensions. 2017 - ARGOCAT AVENGER ST and STX launched new AVENGER ST and STX models - 1 3/8" diameter heavy duty axles, reversible steel rims, Argo "lite-steer" transmission and Beadlock Alloy rims for STX. 2017 - ARGOCAT "Titan" XTI new range CONQUEST- Tried and tested heavy duty XTI and XTD models renamed CONQUEST XTI and XTD with many enhanced additional features.